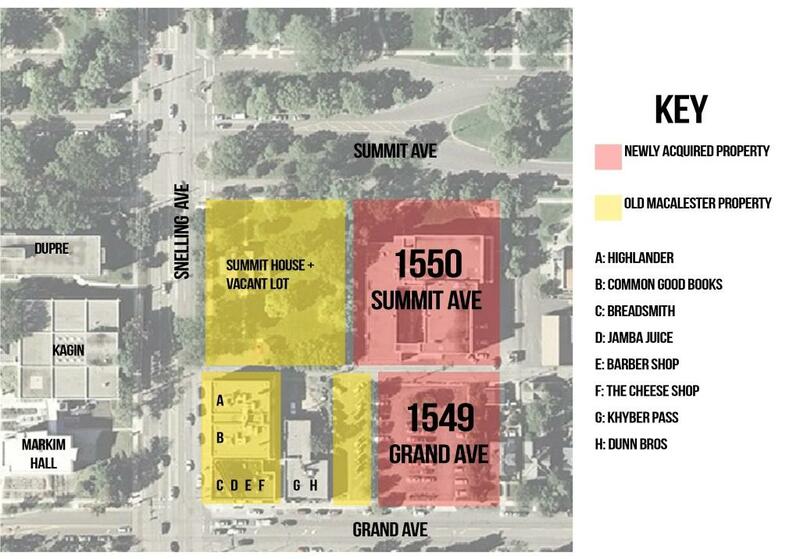 Map of Macalester-owned property between Grand, Summit and Snelling. Graphic by Rachel Wilson’17. Macalester College recently completed its purchase of a few properties close to campus. On November 17, the College closed on properties at 1549 Grand Avenue and 1550 Summit Avenue. The sale includes the school building on Summit Avenue currently occupied by both Laura Jeffrey Academy and the Highland Park Montessori School, as well as the building’s parking lot which is located directly behind the school on Grand Avenue. Despite Macalester purchasing the building, it will continue to be used by Laura Jeffrey Academy and Highland Park Montessori until their leases end. 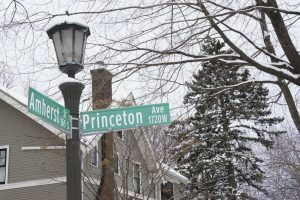 According to Vice President for Administration and Finance David Wheaton, Macalester does not intend to integrate the land into the college’s campus or convert it into a different use for the near future. Instead, they chose to purchase the land as very few properties this size go on the market near campus. 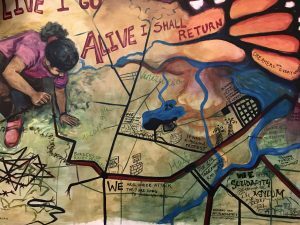 Purchasing the land, Wheaton said, would allow the building to continue operating as is while guaranteeing the possibility of future redevelopment by the college. The property that Macalester just purchased is also adjacent to other properties that Macalester currently owns. The school building is contiguous with the Summit House and a vacant lot owned by Macalester, and the parking lot on Grand Avenue is located next to the Macalester-owned parking lot which borders Dunn Bros. The College conducted a study on converting the space into student housing one and a half years ago. The study determined that using the space as a residence hall would be “possible, but require a bunch of money,” High Winds Fund Director Tom Welna said. The school building has gone through many different occupants in the past few years. It was formerly home to Immaculate Heart of Mary Parish and School, before it merged with a neighboring parish and stopped offering classes at the Summit Avenue building. St. Joseph’s School of Music moved into the building soon after. During the Leonard Center construction, Macalester rented the school building for two years and used it as coaches’ offices and storage. Around 2009, Laura Jeffrey Academy moved into the space. Macalester has been in discussions with the building’s previous owner for a few years, and they made an offer on the building in May 2013. That offer was rejected. Discussions about buying the property resumed in March of this year. According to Wheaton, the purchase cost $4 million, which was drawn from the College’s cash reserves. Macalester did not have to borrow any money to purchase the land.